This property of 380 acres features tall white pines thriving in the thin, hillier soils on the east side of Alden Hill Road. 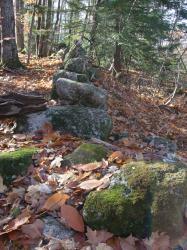 West of the road stands of sugar maple and white pine dominate the hardwood forests along the Androscoggin River. 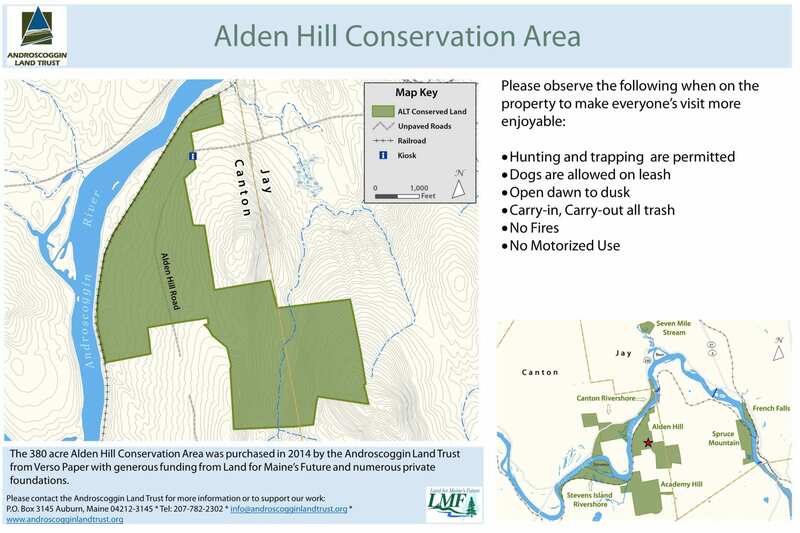 Directions: Alden Hill Conservation Area is accessed via Alden Hill Road off Crash Road in Jay. Follow Alden Hill Road approximately 1.5 miles until the road turns from pavement to dirt. On the right there is currently a wooden sign that reads “International Paper Conservation Area”. The northern property line of the conservation area, which intersects Alden Hill Road, is just north of the sign. The conservation area is on both sides of the road as one travels south along Alden Hill Road until you see a clearing on the left. There is currently no official parking lot or access point to the conservation area, however there is ample room along the edge of Alden Hill Road to park, just be careful of soft shoulders!